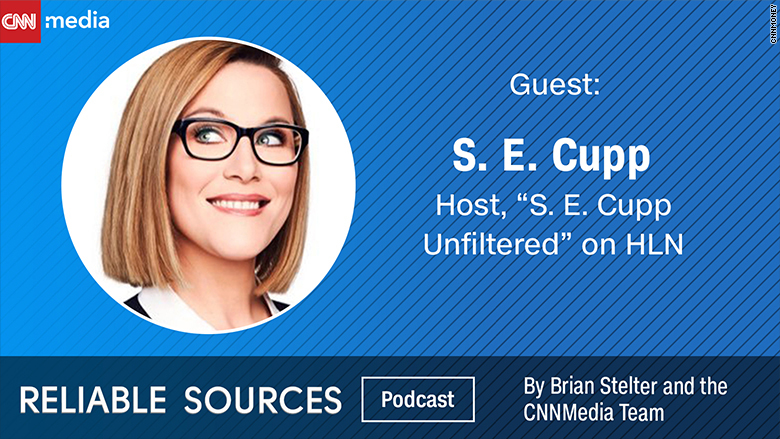 S. E. Cupp's conservative views haven't changed since she started hosting her own show, "SE Cupp Unfiltered," on HLN. But by virtue of her being part of the media business, "a close family member who does not believe the media, does not believe me, and thinks I am fake news," she said. With Thanksgiving just around the corner, Cupp's anecdote is a reminder of how personal polarization can become, and a lesson about how hard it is these days to break through the thick layer of conservative distrust in the media. That skepticism "runs deep," Cupp wrote in her latest op-ed for CNN Opinion's series "Free Press: What's at Stake." "Believe me, President Donald Trump didn't invent it," she wrote. While exacerbated by Trump's anti-media rhetoric, Cupp told Brian Stelter in this week's Reliable Sources podcast that the origin of conservative distrust in the media started "when media got corporatized," centralized in coastal cities, leaving behind Midwestern and Southern hubs. "The big networks and the big newspapers forgot what average Americans -- and by that I largely mean conservatives -- wanted, and cared about, and thought about," Cupp told Stelter. Trump was able to "take the conservative skepticism in liberal media and just make that a skepticism in all media," Cupp said. In doing so, he appeals not just to conservatives, but to other segments of the electorate that feel disenfranchised. "It almost has no political bent," Cupp said. Cupp says that it is "really dangerous" for the President to sow distrust in the media, a crucial institution for a democracy. She also emphasizes that Trump's penchant for discrediting all institutions, from the intelligence community to the justice department, to the military, allows him to "consolidate power." By pushing the narrative that he, and he alone, is the "only person you can trust," he controls "a very powerful microphone," Cupp told Stelter. "It's dangerous when he talks about fake news and it's really dangerous when people en masse believe him," Cupp argued. Cupp believes that the seeds of distrust in the government that Trump is capitalizing on were first planted during the George W. Bush and Barack Obama years. Both administrations, she told Stelter, had "a lack of accountability, a lack of honesty, a lack of transparency," and were also hostile to the press. While she agrees that a portion of the country may be "unreachable" for the time being, she is hopeful about the future. At a time when the country is so polarized, conversations around core American values are becoming more frequent.